WASP offers an ability to take data from multiple sources, whether that is through open or proprietary systems. The Internet of Things provides us with an opportunity to use the data to provide a means of greater analysis and reporting that will facilitate the strategies around Urban development of the future, “Smarter Cities”. Big Data Analytics provides both horizontal and vertical interoperability between Departments, Sectors, Regions and Countries. Smart Cities will in the future collaborate with its citizens and its businesses as these are their income streams and retention is key to a city’s growth, that collaboration with the Private and Third Sectors will provide some key metrics around social value and social economy and the ability to share data across these sectors is imperative. Through WASP we can provide secure, integrated API’s to facilitate data sharing and application connectivity. WASP enables greater control of Contract life cycles and purchasing and through its integrated analytics can drive efficiency models that will create inward investment into further infrastructure that again will drive efficiency. The presentation layer within WASP allows for enhanced reporting and future strategic planning. It is important to understand that any Organisation can be more effective and efficient by referencing a common data-handling process for their staff, businesses, assets, locations, and more importantly its own citizens. 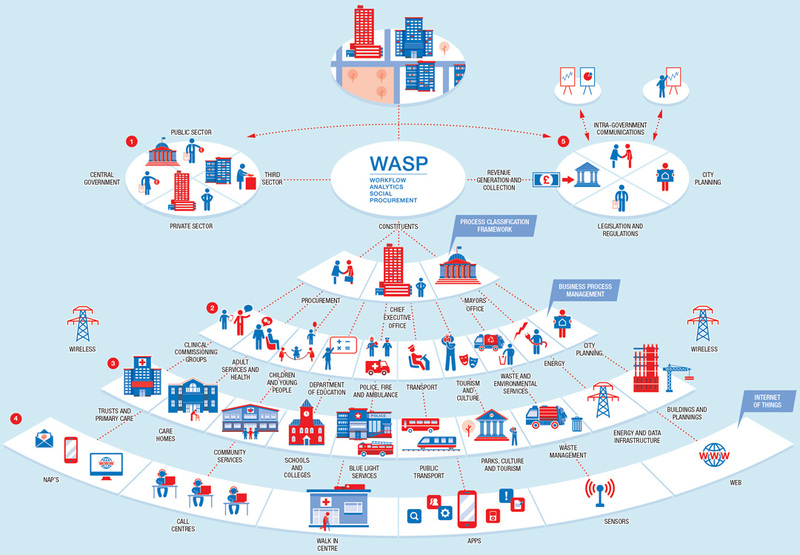 This ultimately improves processes and hence the reason why WASP has an incorporated Process Classification Framework. This provides greater user satisfaction and increases employee productivity and job satisfaction. Through the Consolidation of Technology services – i.e. IAAS (Infrastructure as a Service), PAAS (Platform as a Service) and SAAS (Software as a Service) -business process management can be optimised using standards such as Lean Agile and Six-Sigma methodology to provide efficiencies across processes. This helps promote best practices and enable cost savings while delivering better, transparent services to a city’s citizens. It also provides Root Cause Analysis for effective Budget Management. Citizens of all Genres can initiate contact and interact with local authority services through a variety of channels -including existing channels such as walk in centres, email, web and call centres but also through network access points dotted around the city similar to the LINK infrastructure in New York. Through this medium we can create a proactive BPM (Business Process Management) layer which provides clear direction as to how we interact and make the customer journey more seamless. The data itself from this will facilitate future learning. Empowering city officers and department managers with superior tools and service delivery capabilities makes it easier to budget, respond to demand, and allocate/schedule city resources. In turn, a highly responsive administration is more popular with the electorate and can better address the goals of serving their community and helping it grow more prosperous. A PCF is taxonomy of cross-functional business processes intended to allow the objective comparison or 71- organisational performance within and among organisations. Experience shows that the potential of benchmarking to drive dramatic improvement lies squarely in making, out-of-the-box comparisons and searching for insights not typically found within intra-industry paradigms. The development of the PCF provides the ability to create a standardised approach to City wide processes and benchmarking across those processes. This will facilitate best practice models and develop a connected cities program. It is imperative that there is transparency in the way we spend Public and Private sector funds, and having an integrated financial model that provides real time budget planning and Accounts In and Out processes enables departments to strategise more effectively. By also allowing connectivity with its supply chain creates a model for better procurement of services and cash flow, thus creating a more sustainable Social Value economy. It also provides a route map for driving efficiency; we need to understand how and why we invest in technology and where those budgets should come from. The presentation layers will provide real time reporting more accurately than what is present at the moment, as the data is not in silos anymore and also provides a more vertical and horizontal perspective as to the information needs of the user. The system will work in conjunction with the BPM layer and allow for controlled permissions and security as to who can see information and who cannot. The analytics engine will provide the ability for predicative and potentially Artificial Intelligence capabilities and as Urban growth continues we will be able to simulate and model new cities. LEGAL GOVERNANCE, RISK AND SOCIAL VALUE. There is a huge responsibility to deliver efficient services but this also needs to be procured in a legal way and the complex nature of National and EU procurement rules means that Authorities are mindful of the risk involved in the delivery of goods and services. The WASP platform will be able to provide contract management and real time social value reporting due to the interoperability capabilities. The system will provide direct interaction between organisations and its supply chain. This in turn will drive efficiencies and provide a relationship that does not exist at the moment; this is a collaborative approach and will show how Public Sector and its agents can develop a model of Social Capitalism. Through the development of new Data Centres, hardware, broadband and wireless access, this allows for the development of IT Transformation which will provide huge savings, not only on delivery but around carbon foot printing. Savings of up to 60% can be achieved through the effective shared services.